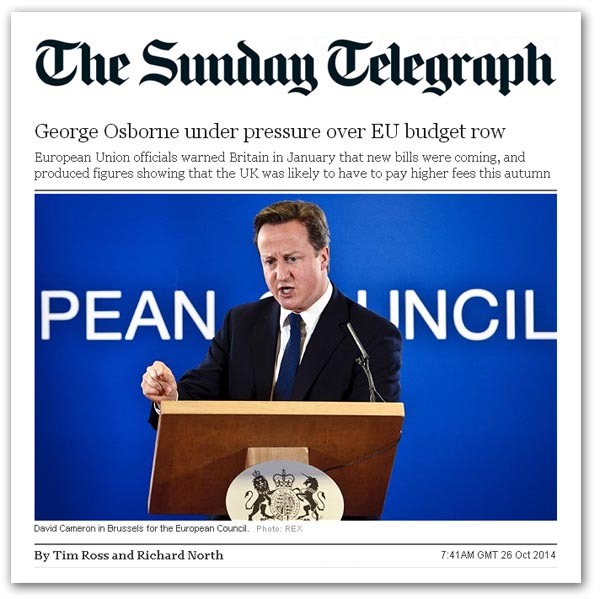 EU Budget Suppliment Debacle Deepens! EU Budget Suppliment Debacle Deepens! Leaving all in some confusion yet showing just how emasculated these United Kingdoms are in democratic terms as vassals of the EU. further to my posting at CLICK HERE it would seem that David Cameron is not the only one who is poorly briefed or telling lies! it does look as if The EU Commission themselves are muddled by the complexity of their own rules! A careful read of this Press Release below, would SEEM to contradict al else that has been published and earlier understanding by both the British Government (aka David Cameron) and The EU itself – not to mention myself who had found myself going down exactly the same line as the professional blogger and political researcher Dr. Richard North! Further with care in your reading of the Press Release it would SEEM to contradict itself within its own text! 1. Who decides to increase Member states’ GNI contribution to the EU budget and why? The different types of own resources of the EU budget and the method for calculating them are set out in a Council Decision on own resources and its implementing regulation. Thus the rules relating to the calculation of Member states’ contribution based on their respective Gross National Income are established in the own resources legislation. In May of each year the Commission and representatives of each Member state meet to establish the estimated GNI of every member state for the year to come. That specific source of income for the EU budget is then adopted in agreement with the Member states. Each autumn, the Commission and representatives of each Member state meet a second time, this time to check whether there are differences between the original GNI estimates and the “real” GNI for the previous year, and whether there any further adjustment to older GNI data, still based on the figures provided by each Member state. Member states’ individual GNI contribution is then adjusted upwards or downwards to compensate for the adjustments. This is a purely mathematical, technical process. So much so, that member states agreed that the Commission can implement the adjusted figures by 1 December every year without any need to submit a proposal to the Council and/or to the European Parliament. 2. 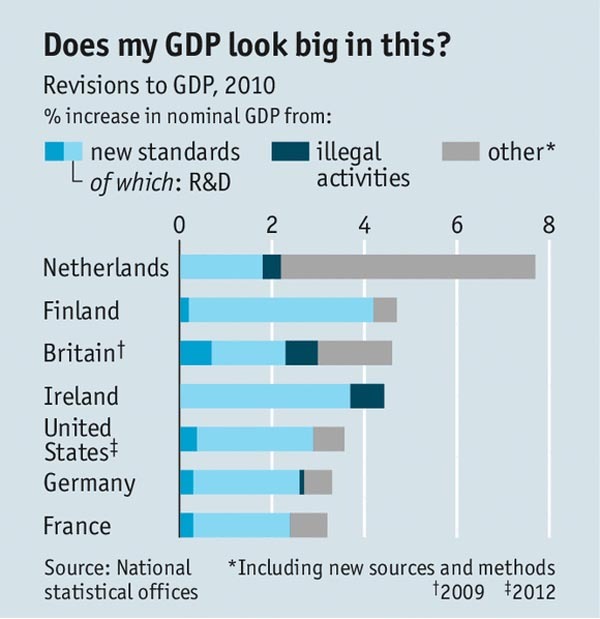 Does this year’s technical adjustment take into account the new method to calculate member states’ GDP (ESA 2010)? No. This new method to calculate member states’ GDP will have no impact on their GNI contribution to the EU budget until the new own resources decision comes into effect, which is probably 2016. 3. Why does this year’s technical adjustment see such big increases of contributions to the EU budget for some member states? This year’s adjustment includes GNI re-calculation dating back to 2002 for most member states and to 1995 for one, as there were a number of unresolved issues that had accumulated over the last years. The decision to resolve these historic issues now results from a joint effort of member states in cooperation with Eurostat. With all these issues now cleared, future such corrections will again be rather minor, as they were in recent years. Some member states have consistently reported too low values for their GNI over the last years, this obviously explain the size of some adjustments upwards. 4. Why has the Commission decided to act just now? As explained earlier, the adjusted GNI contributions must come into force by 1 December at the latest. However, the earlier in the year you calculate the real GNI for that given year the less accurate you are. The Commission must therefore find a compromise between announcing the revised GNI figures as late as possible in order to be as accurate as possible, and as early as possible in order to give member states enough time to adapt to the new figures. This year, member States were informed of the budgetary impact of the new data on 17 October. 5. Do those adjustments always increase member states’ GNI contributions? Not at all; it mostly depends on member states themselves as the basis for such revision is the figures provided by the member states. If your recorded GNI for any given year is lower than what was estimated at the beginning of the year, your GNI contribution will go down. The one thing of which we can all be certain is that the central bureaucracy has NOT, as some would like you to believe, carried out some gratuitous act of enbittered bullying as the present Commission leaves office, in order to vivtimise these United Kingdoms and slap down David Camerons efforts to ‘re-negotiate’ and hold an IN / OUT Referendum when re-elected after May 2015, as promised. What we can be certain of is the unpalatable, for David Cameron and part of the Tory party, is that unilateral re-negotiation just is not on the cards. EU Treaty after EU Treaty to which the British Government has freely, if duplicitously much of the time, signed up clearly states that there is no possibility of an substantial or substantive re-negotiation and that ALL decisions must be on the basis of either QMV or unanimous vote of the EU’s vassal states! This of course places David Cameron and his Government when re-elected, assuming that Ukip has not garnered enough votes to destroy Britain by so consequentially damaging the Tories as to place the utterly incompetent, economic idiots and extremist Fabians etc., in the Labour party, in a controlling position! The problem for David Cameron will be that he will be honour bound to actively campaign, with his Government for Britain to leaver the EU, which is counter to his aims to subjugate Britain yet further to the globalist control of the arcane and outdated EU, which merely acts as obfuscation and a rubber stamp for the issuance of International law by the likes of UN, CODEX, WTO, IMF, WHO and the like. He will have proved that Britain’s 8% influence and voting control of our destiny, whilst still in the EU, is of absolutely no material consequence! The European Union warned Britain months ago that it was facing a massive increase in its EU membership fee, according to documents seen by The Telegraph. A furious David Cameron vowed on Friday that he would not pay an “appalling” and unexpected demand for an extra £1.7 billion in British contributions to the EU budget by the December 1 deadline. However, The Telegraph can disclose that EU officials warned member states in January that new bills were coming, and produced figures showing that Britain was likely to have to pay higher fees this autumn. The disclosure cast doubt on Mr Cameron’s claims that he had been ambushed out of the blue by the demand for more money on the eve of the Brussels summit on Thursday. The development will intensify pressure on the Prime Minister and George Osborne, the Chancellor, over why Britain was apparently so unprepared for the extra surcharge. :: Senior Treasury officials are meeting this weekend, and will be speaking to their counterparts in the Netherlands, Italy, and Greece to build an alliance of countries to fight the extra demands for money. :: It emerged that Britain would face EU fines worth more than £1.3 million a day for every day the country refuses to pay the extra bill. The call for the extra cash, which followed a review of member states’ economic performance since 1995, was described by Mr Cameron as “completely unacceptable”. The detailed demand for £1.7 billion was first sent to EU member state governments on October 17, several days before the information reached the Chancellor. The Chancellor has said he learnt about the bill “earlier this week”, but it appeared to catch the Prime Minister off guard. On Saturday, Sir Bill Cash, chair of the Commons European scrutiny select committee, announced that ministers from the Treasury would be summoned to explain the apparent lack of action over the bill which left Mr Cameron exposed at the summit. The extra £1.7billion bill is a result of changes in the way national accounts are calculated across the world, which have had the effect of increasing Britain’s GDP by more than the European average. This meant Britain’s required contribution to the overall EU budget would also increase by more than the EU average. Different EU member states make different contributions to the EU budget, depending on their national incomes. On January 16, European statisticians said the EU-wide average increase resulting from the change in the way national accounts are calculated was a rise of 2.4 per cent in GDP. For Britain, the projected figure was higher, between 3 per cent and 4 per cent. A prominent MEP warned Mr Cameron yesterday that Europe “expects” Britain to pay the surcharge by the December 1 deadline. “It appears the Prime Minister was surprised by this in Brussels,” said Alexander Graf Lambsdorff, vice-president of the European Parliament. On Saturday, The Telegraph reported that Angela Merkel, the German Chancellor, had told Mr Cameron he should have anticipated the European Union’s demand. According to a diplomatic record of talks between European leaders seen by the paper, the German Chancellor told the Prime Minister the call “did not come out of the blue”. “I understand that it is difficult to come up with €2 billion [£1.7billion] David, but this should have been expected,” Ms Merkel said. The European Commission president, Jean Claude Juncker, also told Mr Cameron to “show some political courage” over the call. Something of the story behind the story on Mr Cameron’s £1.7bn began to emerge in the Sunday Telegraph yesterday, with lead writer Tim Ross kindly adding my by-line to the copy. The Mail on Sunday, however, went for a fictional version of events, going for Mr Gove’s incredible theory that the Barroso personally dumped a £1.7 bill on the UK as an act of revenge. The Financial Times though, is coming up with a completely different version of events. The £1.7bn figure, it tells us, is a one-off payment which accounts for less than 0.1 percent of UK GNI, representing a top-up to UK contributions covering 11 years. Thus, the paper says, Britain is being asked to pay a “modest” adjustment of an extra £150m a year over the period, a sum that would barely deserve a footnote in the UK’s annual accounts. Now, the Mail is saying much the same thing, that “the European Commission issued the demand to the UK after using rules dating back to 1995 and finding Britain’s economy has grown faster than expected, so must pay a greater share to Brussels”. This, one assumes, is based on the Commission Q&A on the revision of Member States’s GNI, which I only saw last night. Contradicting completely my report on the application of ESA 2010, it states that this year’s technical adjustment does NOT take into account the new method of calculating member states’ GNIs. This new method, it says, will have no impact on their GNI contributions to the EU budget until the new own resources decision comes into effect, which is probably 2016. To the question of why this year’s technical adjustment sees such big increases of contributions to the EU budget for some member states, the Commission tells us that this year’s adjustment includes GNI re-calculation dating back to 2002 for most member states and to 1995 for one. There were, we are told, a number of unresolved issues that had accumulated over the last years. The decision to resolve these historic issues now results from a joint effort of member states in cooperation with Eurostat. With all these issues now cleared, future such corrections will again be rather minor, as they were in recent years. This seems to be borne out by sight of an (undated) information note to member states, which sets out the sums involved, on which much of the media publicity has been based. As to the legal authority to apply retrospective adjustments, the Commission cites Council Regulation No 1150/2000 of 22 May 2000 implementing Decision 94/728/EC on the system of the Communities’ own resources. It would seem that Article 10(8) applies, referring to Article 3(2) of Directive 89/130/EEC on the harmonization of the compilation of gross national product at market prices. There is nevertheless something very odd about the Commission Q&A, because it cites Council Decision 2007/436/EC on the system of the European Communities’ own resources, as being the basis for calculating the Members’ contributions. Yet, as we see here, that Decision has been repealed and replaced by Council Decision 2014/335/EU on the system of own resources of the European Union. It takes effect from 1 January of this year. The crucial thing about this updated Decsion is that it tells us that Member States’ GNIs “shall mean an annual GNI at market price, as provided by the Commission in application of Regulation (EU) No 549/2013 (ESA 2010)” – thereby installing the new European System of Accounts, except that pro temp contributions were to be based on ESA 95 because ESA 2010 had not been available at the time of the adoption of this Decision. But, the Decision went on, “the contributions should be adapted as soon as all Member States have transmitted their data on the basis of ESA 2010”. “In the event that there are any amendments to ESA 2010 which entail a significant change in the level of GNI”, it then said, “the ceilings for own resources and for commitment appropriations should be adapted again”. On this basis, it would appear that the Commission is wrong in claiming that ESA 2010 does not apply. Its own legislation says it does, and unless there is an unknown factor here, the new standard applies to the current figures and the adjustments. Therefore, what I think has happened is that, guided by Directive 89/130/EEC, the UK and other Member States have revised their GNIs retrospectively using ESA 2010, which has given rise to the adjustments recorded. But it must also be remembered that the procedure requires Member States to calculate their own GNIs, and send the results to the Commission. This is not something the Commission does for us – we do it for ourselves. Thus, as far as the awareness and the advance notice goes, my previous report would seem to be accurate (unless or until we see further developments). The UK was informed that changes were in progress. It is unlikely that Mr Cameron can claim that the Commissions was not entitled to the money it is claiming, as the sum is based on data provided by the UK – presumably calculated by the ONS – in accordance with well-established procedures. Since the ESA 2010 changes have been flagged up continuously, the UK government – and therefore Mr Cameron – can have no justification for saying they didn’t know what was coming. Seldom though have I met a more complex scenario – where the Commission also seems to be getting it wrong. Even Mr Barroso didn’t seem to know what was going on. And that may just provide a small window of opportunity for Mr Cameron. It the Commission itself is all at sea, he could claim that it is unfair to expect him to know better. Of course, his “Rolls-Royce” civil service could have told him, except that Rolls-Royce cars is now owned by the Germans. That is perhaps why Mrs Merkel was in the know and Mr Cameron wasn’t. So Has David Cameron Made A €2B Hole In His Electoral Future? Clearly he was either deliberately publishing spin to dupe the electorate OR criminally incompetent & ill informed! many will have by now noted David Cameron’s ill informed outburs over his Government’s undertaking to pay an additional £1.7Bn. to the EU. Within a very short time I Tweeted that it was possible that with his idiotic & ill tempered outburst he may well have signed his electoral ‘Death Warrant’. In discussion of the complex nature of the agreement he was very publicly posturing to SEEM as if he was outraged it became apparent that Richard North was working on a complex blog explaining the details – which I have with his full permission posted below as a >GUEST POST<. In 2012 & 2013 the UN was negotiating with all the relevant international organisations WTO (World Trade Organisation), CODEX (Codex Alimentarius [standards for food etc. ]), OECD (Organisation for Economic Co-operation and Development), USA, EU, etc. etc. to agree a new and more accurate INAS (International National Accounting System) which would give a standardised method of presenting National Accounts. The UN achieved agreement in early 2013 – on 13-Mar-2013 for and on behalf of the British Government William Hague signed up to this new system of accounting which resulted in new and standardised methods of presenting such figures as GDP (Gross Domestic Product), GNI (Gross National Income) and the like. The final agreement we had entered into was presented and published 22-Apr-2013. The EU then carried out almost its only relevant action of significance which was to rubber stamp the new methods into EU law, as the EU makes very little actual law of any consequence being largely a redundant and outdated concept. The EU merely translates laws handed down to them by such International bodies as The WTO, IMF (International Monetary Fund), CODEX, UN, WHO (World Health Organisation) and the like putting their impramature on the item and them inclines to pretend it is some authoratitive EU decision when clearly they have merely acted as a rubber stamp! Naturally the sooner Britain can Leave-The_EU we can resume our positiopn at the top table internationally negotiating with the many global bodies that make the law and acting in defence of not just Britain but the many smaller countries that formerly depended on Britain through the Commonwealth to ensure a sound grounding to new international laws rather than being muzzled and sidelined by our membership of the EU who are seeking ideas that are one size fits all on the basis that their representative may well be considering the interests of Malta, Latvia, France or Spain but more probably Germany or France above those of these United Kingdoms and Commonwealth countries and the Anglosphere! The mantra that at thwe heart of the EU Britain is better represented is clearly nonsense as it not just distances Britain from the decision making but divorces us from influence of any value on the world stage where we have so many allies and trading partners of long standing. To revert to the present debacle over our debt to the EU of a supplementary €2Billion, the methodology of calculating payments to the EU was defined when we signed The Treaty of Rome and has been clarified and recodified through the treaties of Amsterdam, Nice, Maastricht and most recently Lisbon. The minutiae of the payment structure was an integral part of Maggie Thatcher’s Government signature to the 1988 Single Market Act. Further the talks regarding INAS have been ongoing within the UN since 1993 andf as I said were signed off by Britain in March 2013 leading to enshrinement in the ESA as published 22-Apr-2013. Our own ONS (Office of National Statistics) in May 2014 provided an executive summary and a 650 detailed exposition of the new agreement we had chosen to be bound by via the ESA, including a detailed section warning of the consequences to GNI – which materially alters our annual debt to the EU – a matter which was published and widely distributed by the EU in an open Press Release in January this year. We have all by now heard David Cameron’s posturings on this matter but in his refusal to pay as it is British tax payers’ money and they are his employers you may have missed the weasle words that sotto voce stated as to be expected to pay by 01-Dec-2014 was unreasonable – OK so when will he pay? You will note Barosso has publicly reminded everyone that the agreement was made long ago and that the agreed due date for calculation was December annually – clearly the emergency meeting of relevant ministers is as to when the due date for payment shall be executed, after which default will be fined on a percentage basis amounting to 43Million a month (though I am uncertain whether that will be 43M £s or €s) – no doubt David Cameron will be seeking to save face and have, if not the payment, the fines payable from AFTER the General Election! & I refuse to pay”! I trust this helps clarify the position a little and I apologise for including this in what is primarily a Ukip web site blog but it does materially play into the hands of Ukip amongst the less well informed though as so often through no ability of Ukip! As one senior journalist recently said to me Ukip are like a minor league football team, they lack a competent manager, have poor coaching, are without a star striker, utilise the owners wife to do PR and have little understanding of the rules nor the required kit and are clearly ‘unfit’ – when they find themselves playing against a Premiere League team they jun around the pitch in eveer decreasing circles shouting and abusing causing something of a melee, which the professional Premiere team find bemusing resulting in many errors that place Ukip in the embarrassing situation of winning as a result of a series of own goals by the championship team! Failing all else they just hurl abuse at the referee and other match officials to get attention and distract from the actual game. on a building site in Kent! You will no doubt have realised from the leading article in today’s Telegraph and numerous other papers, even the broadcast media the journalists would seem to have the most febrile grasp of how the EU functions, almost on a par, it would seem, to that of The Prime Minister! It is strange that the media and politicians are so ill informed when you consider the salaries, perks and expenses most of them receive! Even stranger is the fact that the politicians fail to read copious reports produced at considerable cost to the tax payers, produced often by their own departments! However to be fair it is worth noting that in about May The Financial Times published an article on the subject, which clearly few read, as did The Economist in August! When the news broke of the “shock” demand that Britain should pay €2.2bn (£1.7bn) into the EU coffers by the end of next month, the media was all at sea as to the reasons. The likes of the Guardian had it that it was: “because the UK economy is doing better relative to other European economies”. Yet this is not closer to the truth than many of the other theories that have since sprung up. According to the Guardian, British and European Commission officials confirmed that the Treasury had been told last week that budget contribution calculations based on gross national income (GNI) adjustments carried out by Eurostat, the EU statistics agency, had “exposed a huge discrepancy between what Britain had been asked to contribute and what it should be paying, because of the UK’s recovery”. The “bombshell”, apparently first reported by the Financial Times, was dropped into the middle of a European Council meeting in Brussels where Cameron and 27 other leaders were “mired in tough negotiations over climate-change policy and attempts to agree big reductions in greenhouse gas emissions by 2030”. In response, or so the story went, a Downing Street source said: “It’s not acceptable to just change the fees for previous years and demand them back at a moment’s notice. The European Commission was not expecting this money and does not need this money and we will work with other countries similarly affected to do all we can to challenge this”. Such was the apparent suddenness of this demand, though, that Kirkup in the Telegraph was speculating that the “colleagues” were perhaps EU trying to push Britain towards leaving. Even the noble Guardian – lover of all things “European” – remained nonplussed, telling us that the “infuriating” reason for this sudden hike is “because Eurostat has reviewed the figures and believes the UK economy has performed better in recent years than was previously believed”. The following day had the Independent tell us that George Osborne had “left David Cameron in the dark” about the EU’s “unexpected” demand. The Chancellor, we were told, had known about the bill since the beginning of the week, yet the prime minister had only been told on Thursday, just as he had been on his way to Brussels for the European Council. Danny Alexander, the Chief Secretary to the Treasury, is said to have known about the bill before Mr Cameron was informed, which has left the prime minister venting his anger from a podium in the press suite in the Brussels Council building, declaring: “This is completely unacceptable. It is an unacceptable way for this organisation to work – to suddenly present a bill like this for such a vast sum of money with so little time to pay it”. Thus, days after Mr Cameron’s supposed “ambush”, the collected political/media establishment are still having trouble coming to terms with what precisely has happened, and why. So lacking is the comprehension that the Daily Telegraph leader yesterday was accusing the Commission of acting on a “whim”, while another pundit was arguing that the timing was politically motivated. Shining like a beacon through the morass, however, are the comments from Angela Merkel during the European Council. According to the Telegraph, she told David Cameron that: “This did not come out of the blue”, adding that she could “understand” that it was difficult to come up with money but “this should have been expected”. Remarkably, diplomats are recorded as described Merkel’s intervention as “cold-blooded and ruthless” but this is hardly the case. The German Chancellor was only stating the obvious – and very far removed from the Telegraph’s earlier idea that some anonymous official in the EU’s statistical department woke up one day and decided – presumably just for the fun of it – to review all the GNI figures. It should have been expected. In fact the process which has delivered this result starts, not with Eurostat but with the United Nations and its System of National Accounts, a process of producing standardised accounts for every nation in the world, which has been in place since 1953. Far from coming out of the blue, the timeline for the events of last week start in 1993, when the last standard was published, a process which automatically triggers a review which inexorably leads to the next published standard. If this seems complicated, it isn’t really – it is a process of continuous review, carried out by many international and national organisations, the bureaucratic equivalent of painting the Forth Bridge. As soon as you have finished, you start all over again. In this case, the review triggered by the 1993 standard was carried out under the responsibility of five organisations: the UN as the lead organisation, plus the International Monetary Fund, the OECD, the World Bank and … the European Union. It took 15 years, numerous meetings and many consultation sessions, before the work complete. Thus, it was not until 2008 that the United Nations was able to issue its revised standard, setting out the new international rules for how nations should calculate their gross national products (and their GNIs). This represented – as the introduction to the standard declared – “an update, mandated by the United Nations Statistical Commission in 2003, of the System of National Accounts 1993”. The new standard was formally published in 2009, which then put the EU out of line with the global system. So, in December 2010, the Commission issued a legislative proposals (COM(2010) 774 final) aimed at bringing its own system – the European System of Accounts (ESA), last amended in 1995 – back into line. The proposed regulation took over two years going through the process, but was agreed by William Hague at the Council of Ministers in Luxembourg on 22 April 2013, following a single reading by the European Parliament on 13 March. It became Regulation (EU) No 549/2013 of 21 May 2013 on “the European system of national and regional accounts in the European Union”. A mere 727 pages long, its short title was the “ESA 2010 regulation”. For those who cared to read the European Parliament position document, it clearly warned that: “The Commission uses: “aggregates of national and regional accounts for Union administrative purposes and, in particular, budgetary calculations”. Thus, anyone paid to watch such things (such as Treasury officials) should have known that there was a potential for impacting on UK contributions to the EU. Then, in January 2014, Eurostat pitched in with a press briefing, explaining the impact of the changes – pointing out that the US – which had introduced the international standard a year earlier – had experienced a 3.5 percent “boost” in its GNP – entirely due to the new method of accounting. Making things abundantly clear, the press release also noted: which should have made things clear. National accounts, it said, “have a deeper role. They are at the source of many of the indicators that constitute the quantitative backbone of European economic governance. Gross Domestic Product (GDP), more precisely Gross National Income, is at the heart of the calculation of the EU budget”. The European Union, we were also told, “will fully move to ESA 2010 in September 2014, when the data transmission programme included in ESA 2010 Regulation enters into application”. It warned: “The national accounts data will then be compiled all around Europe based on the new methodology”. That most certainly should have rung alarm bells. Every year on 1 December, the Commission revises its estimates of member state liabilities for their annual contributions to the EU budget. And what was coming through was that the UK would be showing a rise in GNI higher than the European average. Interestingly, the change to the criteria was flagged up by the Financial Times, but not until 23 April 2014 – nearly a year after the EU regulation had come into force. It did not reveal the UN source though. In our post, a few days later, though, we did track down the origin, noting that the FT was remarking that the picture on the UK economy (then improving) was to get even better in September when the UK “adopts the new international standards for national income accounting”. Then, just to add to the picture, the change was also flagged up by the UK’s ONS in May 2014, and also by the Economist magazine in the August. This time, the UK’s relative position was shown, with an increment of about 4.5 percent in its GNP. As other EU member states were not increasing by the same amount, it should then have been obvious to Treasury officials that the UK’s contributions to Brussels were going to increase by a substantial amount. If there had been any doubt, Eurostat – now with a legislative mandate to produce a new system – had in any case come up with a 655-page document in July 2013, describing the full methodology on the ESA 2010 standard. And it was this methodology that was to be applied by ONS, which calculated the figures and passed them to Brussels. Currently, with the September 2014 implementation deadline passed, Eurostat has checked and approved the revised GNI figures prepared by the EU member states, and passed them on to Brussels. And it is on these figures that latest EU contributions have been based for the 1 December review – one of which Mrs Merkel was apparently aware, but was apparently unknown to Mr Cameron. The irony now is almost too much to bear. When the UK joined the EEC in 1973, it was felt it that it was paying an excessive budgetary contribution – excessive because the UK was undergoing financial crises and its GNP was depressed. It was then proposed that the contributions should be linked to GDP – which latterly became GNI – but this was not implemented until 1988 as the Own Resources Decision (ORD) 1988. But that was putting into effect the 1984 agreement with Margaret Thatcher at Fountainebleau, after she had settled Britain’s rebate. At the heart of Mr Cameron’s travails, therefore, is Mrs Thatcher’s famous “handbag” victory, reducing Britain’s contributions. Perhaps it should have come with a heath warning: “what goes down can go up”. With Britain’s annual contribution to the EU now linked to GNI as a result of Mrs Thatcher’s endeavours, this made it inevitable that, with the GNI increasing under the new, UN-mandated system of accounting, Britain’s contribution was going to increase. It is thus all very well for Mr Cameron to huff and puff about refusing to pay a “completely unacceptable” bill, but he has no grounds to do so. The original system was agreed by Margaret Thatcher. Amendments were approved by Tony Blair’s government and Gordon Brown in 2007, making them equally responsible, and the new system of accounting was agreed by Mr Cameron’s own government last year. Thus, Mrs Merkel was absolutely right. 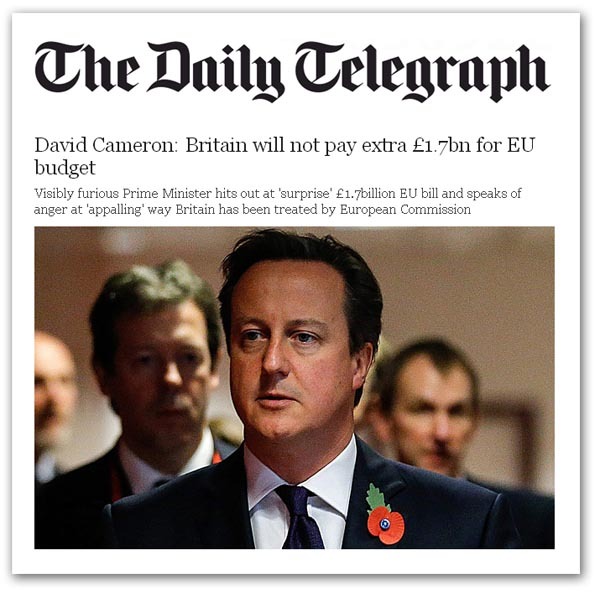 Mr Cameron should not have been in the least surprised by the £1.7bn additional bill. This is nothing to do with the improvement in the British economy – it simply reflects a change in the accounting procedure, which has been on the stocks for two decades, the effects of which were predictable five years ago. Although one is concerned for the poor benighted taxpayer, therefore, there can be no sympathy for Mr Cameron. This is the man who is in favour of continued membership of the EU: all he had to do was read the 727-page regulations which his government approved, or the 655-page explanatory document produced by Eurostat. He would then have known exactly where the UK stood. With his government having agreed the new regulation, bringing in the changes to the way the GNI was calculated – and the consequences of those changes having been flagged up – Mr Cameron has no excuses. Alexander Graf Lambsdorff, the German MEP who has been speaking to the BBC is absolutely right: “everybody has to pay their dues”. Whether we like it or not, his government is legally obliged to pay the bill, as it conforms with the system he personally endorses and which his government has approved. But the biggest irony of all is that no-one ever set out to increase the UK’s bill. This is simply an unintended consequence of the routine processes of globalisation that are going on all the time – unseen and largely unrecognised. But once the UN had changed the system, the EU had no choice but to conform – leading to the current situation. Presumably, Mr Farage is now going to demand that we leave the UN – one of the many villains of the story. 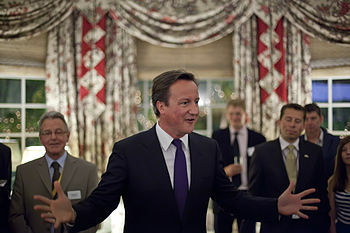 But at the heart of Mr Cameron’s discomfort, it seems to me, is a failure of communication. He should have been told well in advance what was going to happen. And there lies a final irony – he was in Brussels trying to convince the “colleagues” to buy into his climate change fantasy, which is set to cost the UK £1.3 trillion by 2050. Against that, a mere £1.7bn seems small change. #0187* – £2M more for BUBBLY & A 5.9% Budget Hike leaves UK Students Protesting In The Streets! £2M more for BUBBLY on the EU ENTERTAINMENT BUDGER & A 5.9% Budget Hike leaves UK Students Protesting In The Streets! STUDENTS MAY BE THE FIRST BUT MORE WILL FOLLOW! UNTIL THEY REALISE THE FUTILITY OF CLAMOURING FOR NOTHING! I just listened to this speech in The EU Parliament at about 22:00hrs. Last month in Strasbourg, this Parliament voted through a 5.9% increase in the EU budget. This included an extra 2 million for “entertainment” – to support the champagne lifestyle to which this place has become accustomed. I found the way in which colleagues applauded themselves to be offensive within the context of an economic crisis. Today, the victims of this crisis from my constituency in Britain’s West Midlands are making a stand. Students and university lecturers took their concerns to the streets of London. Whilst I deplore the action of a few today I applaud the many. Students will be hard hit by the austerity package. Tuition fees in universities are set to triple. Courses are being scrapped, places are being cut back, and infrastructure will be put under more pressure. Tomorrow’s talent, that we will all rely on in the future, is being stifled. It is the younger generation that will suffer the most. Enjoy your Champagne, ladies and gentlemen. Fairly apposite for the day on which 15 coaches of students from one University alone who had responded to LibDim promises and those made directly to them by Nick Clegg went to London to protest at his personal dishonesty and betrayal over University fees. Interestingly whilst the students protested and an MEP made a 10pm. speech it is worth noting that out of the last 20 Fisheries Committees Nigel Farage has only turned up to 2!!! Ever present when there is a chance to make a fool of himself or show off – just what does Farage do to justify the £Millions he has pocketed? #0169* – GOOGLE Search Is No Friend Of UKIP – IT TELLS THE TRUTH! Results from GOOGLE Daily Search Are No Friend Of UKIP – They TELLS THE TRUTH! UKIP – vs – EUkip: #0168* – UKIP BROUGHT INTO DISREPUTE AGAIN BY …By Greg_L-W.
From the official website: Paul Nuttall MEP, UKIP’s Chairman has highlighted a poll released today that shows that 75% of the British Public want a. You will note a number of postings by dedicated UKIP supporters like myself – who in despair seek to expose the undefendable corruption of their leadership team and its parasites. Then of course there is the obligatory ammunition supplied by UKIP leadership which so competently aids the vile BNP – Sadly UKIP under Farage has also become vile with its betrayal of these United Kingdoms, the betrayal of UKIP members, the betrayal of the electorate AND THE GROSS SELF INDULGENCE of its own leaders and staff! I have NEVER, will NEVER and have no understanding of how anyone could be so degenerate as to support The BNP but that time and time again they are able to expose the infantile, ignorant and insincere behaviour of the nere do wells, self seekers and scum that are now, almost without exception UKIP’s leadership and their paid praise singers is a constant source of embarrassment for decent folk. AS UKIP chairman Paul Nuttall MEP prepares for the second day of the EU summit he blasted the efforts of British PM David Cameron. “The Prime Minister has spun himself into a corner making wild and unrealistic pledges which he could not keep,” Mr Nuttall said. “This 2.9 per cent increase in the EU Budget means the EU will dip into the pockets of the British taxpayer for an extra £435 million a year. COMPARE THAT with what UKIP seem to have actually done themselves! & Here is today’s revelatory offering from the odious BNP sadly well positioned to criticise and expose UKIP! In yet another shocking betrayal of their core supporters and their own party’s supposed policies, eight UKIP MEPs have voted in favour of a European Parliament motion authorising increased EU power and taxation. Observers were astounded when UKIP MEPs Nigel Farage, John Agnew, Marta Andreasen, Gerard Batten, John Bufton, Derek Clark, William Legge and Paul Nuttall all voted in favour of the Parliament’s position on the 2011 draft budget on 20 October. Even the Tories voted against this amendment, as did Nikki Sinclaire, Morten Messerschmidt and several others from the EFD group (to which UKIP is affiliated), along with BNP MEPs Andrew Brons and Nick Griffin. One UKIP MEP at least did not stab all UKIP supporters in the back. Godfrey Bloom voted against the motion, while three other UKIP MEPs: David Campbell Bannerman, Trevor Colman and Mike Nattrass did not bother to turn up for the vote. It is reported that Mr Farage’s decision to vote in favour of the motion has caused even further dissent within UKIP’s ranks and might affect his chances of retaking the UKIP leadership. In any event, the disgraceful betrayal of British taxpayers and UKIP supporters will undoubtedly plague that party for a while to come and it is hoped that more of its members will realise that the British National Party represents the only consistent and reliable anti-EU party in Britain.